DETROIT – The road-racing inspired Camaro 1LE performance package returns for 2013 with unique gearing, suspension tuning, and tires that makes the model capable of more than 1 g of lateral acceleration and a sub-three minute lap time at Virginia International Raceway’s Grand Course. It is offered on Camaro SS coupes with manual transmissions. For 2013, all Camaro SS models including the 1LE will feature standard variable-effort electric power steering and an available dual-mode exhaust system. Both features were introduced on the ZL1. 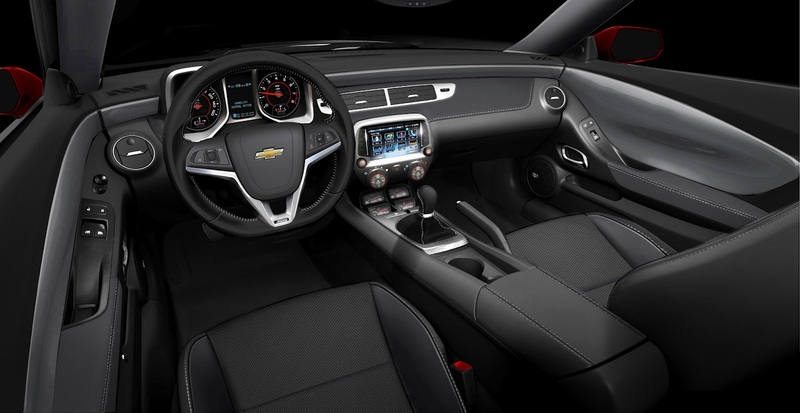 Additionally, 2013 Camaro LT, SS and ZL1 models are available with Chevrolet’s color touch radio with MyLink infotainment system. Visually, the 1LE package for 2013 is distinguished by its matte-black hood (covered in a vinyl wrap to prevent glare from the sun while serving track duty), front splitter and rear spoiler – as well as the 10-spoke ZL1-based wheels, which are finished in black. The functional front splitter and rear spoiler contribute to the car’s on-track performance by helping to reduce aerodynamic lift at high speeds. Inside, the 1LE package incorporates the ZL1’s flat-bottom steering wheel, trimmed in sueded-microfiber and designed for easier heel-and-toe driving on the racetrack. The quick-acting, short-throw shifter from the ZL1 is also trimmed in sueded microfiber.